Welcome to The Midnight Garden’s March Favorites! This is a monthly feature where we bloggers talk a little bit about our favorites in any given topic that might tickle our fancy. We figure it would be a fun way for all of us to get to know each other! 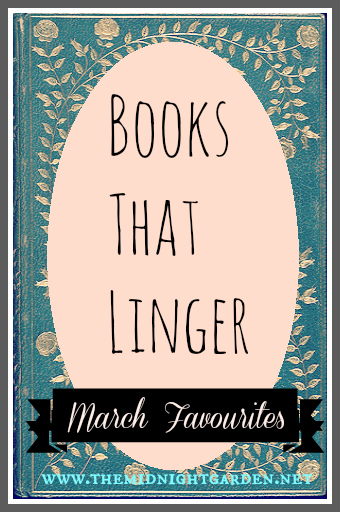 This month we’re talking about some of the first books we’ve ever read; books that have, over the years, lingered. Do you remember the book that started it all? The book that made you see that reading is important, that words have power? Do you remember the moment you became a reader? For us, the following are some of the first books to truly affect us…some of the first to open our eyes, our ears, and our hearts to stories. And beware, there are spoilers ahead! And I found myself softly relating to some of the things I was reading. I related to Jess’ shyness and fearfulness, I related to Leslie’s alienation and desire to make friends. They evoked within me emotions I hadn’t really recognized and put into words until I saw them on the page — in the faces of these two young characters. But more than that, it was simply that I was captured by their bond. It was sweet and honest. And it made me long for the same. I remember reading Leslie’s death. I remember looking around at my classmates and wondering why no one was crying…because in that moment, I was surprised to realize that it was all I wanted to do. I’ve known the secret power of storytelling ever since. In third grade we had to find a book from our school library to do a book report on. I remember walking the stacks, running my fingers along the rainbow of spines–some weathered and cracked under my fingertips, some perfectly smooth in dust jackets or layers of thick tape–and choosing one at random. It was Dear Mr. Henshaw by Beverly Clearly, and I’m pretty sure fate was guiding my hand there, because I don’t know if I could have picked a more perfect book for myself. In it, Leigh writes to his favorite author, asking him questions for a biography he’s doing for school. Eventually they become penpals, with Mr. Henshaw giving Leigh all sorts of advice about his parents’ divorce, bullies at school, and his absent dad. It was the first book that felt as though it was written exactly for me. I had divorced parents. I had an absent dad. And even more than that, it made me wish I could connect with an author like that. That I could write to LM Montgomery or Ann M. Martin or Beverly Clearly and tell them exactly how much joy they’d given me with their books. I wore the cover off Dear Mr. Henshaw, and fifteen or so years later when the internet took off and authors suddenly became accessible and approachable, I thought of Beverly Clearly and Leigh and Mr. Henshaw, and said thanks. When I was little, my mother took me to the library every week, so I can’t even remember a time when books weren’t a part of my life. 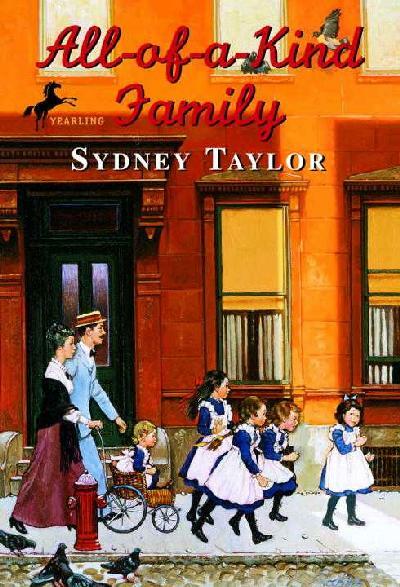 The first time I stopped to think about how much they could mean, however, was when I read Sydney Taylor’s All of a Kind Family. I know, I know–I chose this as one of my holiday favorites not too long ago. But the series, which follows a family of Jewish sisters growing up in the early 20th century, meant a lot to me for many different reasons; one of the most important being that they made me realize how very precious a book can be. In the very first chapter of the very first book, Sarah has misplaced a library novel and dreads having to tell the librarian about her dastardly deed. The heavy responsibility she feels, the pretty library lady’s sympathy because replacing the book is very costly to a family living on the lower East side, Sarah’s joy when a solution is found so her beloved weekly library trips aren’t spoiled–all that made me love my own books just a little bit more fiercely. Books play a big role in this series in other ways, too. 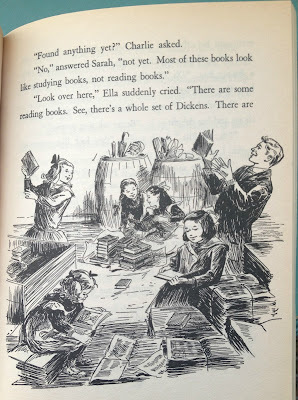 Here’s an illustration of the girls’ delight when their father, who trades large lots in his junk shop, invites them to choose whatever books they want from an unexpected shipment brought in by a street peddler. From fairy tales to a set of Dickens to a lovely book of paper dolls, the girls’ excitement over their finds is absolutely infectious. “May we keep them all?” Ella asked. When he said “Yes” they could hardly believe their ears. They never thought to own even one book and now they had twelve. It was too wonderful! 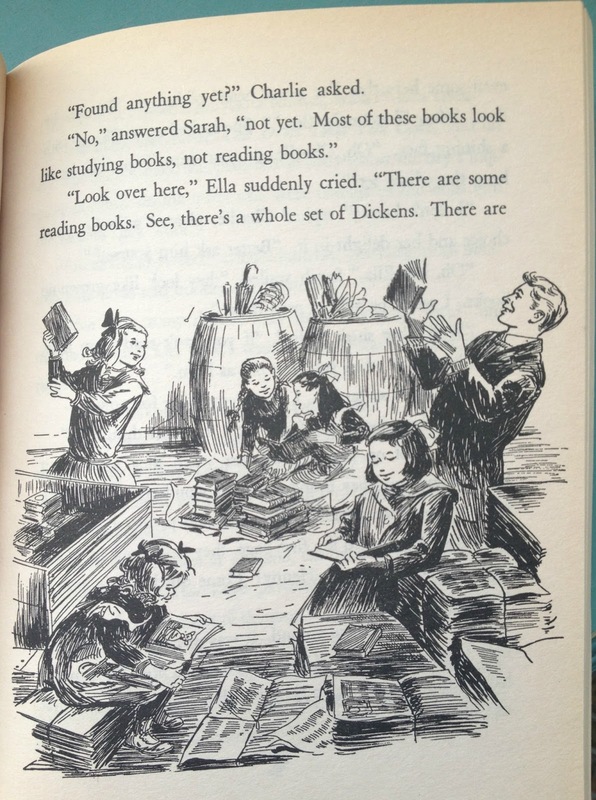 Isn’t that feeling of incredulous joy something every bibliophile has experienced? It’s amazing that we have the luxury of such a wealth of knowledge and adventure at our fingertips. After all this time, I still feel the same way about books that those dear All of a Kind girls did. It goes without saying that we wholeheartedly recommend these books that have meant so much to us as children, and even now as adults. Tell us, what was the book that made you a reader? Where We Get Our Books! I cannot think of one book because there are so many that I loved. Although one that has stuck with me throughout the years was Kira Kira by Cynthia Kadohota. I read that one back in 4th grade. One of the reasons it stuck with me was because it was such a powerful book, before that I mostly read Junie B. Jones, so this book was a big step up for me as a reader, I started exploring more and stepped out of my comfort zone. Oh this was a great post! I think that one series that got me really reading was The Nancy Drew mysteries. Loved those. I remember reading Bridge to Terabithia when I was much younger. It was one of the first books that I read at that age with real, true hurt and pain in it. B.F.G. (Big, Friendly Giants) by Roald Dahl is undoubtedly one of my favorite books of my childhood. Anything by Roald Dahl is amazing. This book was one of my absolute favorites as a child. I read it many times! I also read all of Andrew Clements’ middle-grade books, and they pretty much transformed me into a book lover. I’ve been reading for a very very long time. I was one of those Book It nerds who was unrelenting in reading enough books to win a personal-pan-pizza from Pizza Hut. It may just be that contest that started it all. I enjoy reading and always have, but I’m not quite sure which book as a child made me into a reader per say. Hmmm…as for books that linger, the Goosebumps series always made me happy and freaked out. That thrill feeling is what kept me going. It still very much inspires me to read today. It’s hard for me to pick one…I hardely remember NOT being a reader…I remember reading Ella Enchanted when I was 11, and that sealed the deal for me. And that has still remained one of my favorite books to this day. For me, it was Matilda by Roald Dahl. I found it whimsical and fun and I could identify so clearly with Matilda in a bunch of ways, including the fact that she was a major bookworm. Bridge to Terabithia… Just thinking about it, all these years later, can still make me boohoo. I read a lot when I was younger, until I was 14 or so and stuff happened and books went by the wayside. There were a lot of books that I loved in a big way before then. But I will go with a book that got me back into reading later in my teens; that brought back that serious passion that I had before and haven’t lost in 12 years, even at 30. And that would be Harry Potter and the Sorcerer’s Stone. I know it isn’t a big, emotional, life lesson kind of book, (even though it is in a way), but I will never forget that it brought me back around to reading. And in honor of that, and just because it is one of the best series EVER, I try to make time to read it once a year. AWESOME meme, by the way!! Oh goodness, Bridge to Terabithia, is such an amazing book. Few books can make me cry and even fewer can make me cry again and again, even after I know what’s coming and expect it. I can’t tell you why, but Bridge to Terabithia is one of those rare heartwarming yet utterly heartbreaking stories that will stick with me forever. I wasn’t really a reader as a child. It was forced and so naturally I wanted nothing to do with it :p Until, Harry Potter. dun dun dun….pretty much, the rest is history. I was sucked in and engaged like I never had been before. It made me the reader I am today. I <3 J.K. Rowling for that alone. What a wonderful post, and how eloquently each of you writes about the book that made you a reader! I don’t know if I can identify a single book. I had my tonsils out at age 6, and spent a week stuck in bed in my grandparents’ house. In desperation after finishing my own few books, I turned to my mom’s old Bobbsey Twins books. I must have gone through 20 or 25 of them that week. They made no deep impression on me, but from that point on, books were my friends, my escape, my entertainment, my education… my life. Some of the books that did make a very strong early impression on me were The Lion, the Witch, and the Wardrobe and Lloyd Alexander’s incomparable Prydain series. Oh, and The Secret Garden. To the first two I owe my lifelong obsession with fantasy. To all three, I owe my love of Great Britain. For me it was the Harper Hall Trilogy by Ann McCaffery. I discovered them at the library and kept checking them out over and over! My favorite book that still lingers is, well the books, is the Harry Potter series. Something about that book when I first read it that just made me so happy. I would re-read the books while waiting for the next book to be published. Still find myself re-reading those books. For me it would have to be Redwall by Brian Jacques. It started me reading and gave me my love of fantasy! My second would be Alanna by Tamora Pierce, I can’t even count how many times I have reread this! The second I learned how to read well enough that I could do it on my own, I basically moved into the local library. I don’t even remember what I read, the sheer volume of books makes it impossible to pick one. I think the first book that ever really stuck with me in a significant way was The Giver by Lois Lowry. I read it for my 5th grade reading class (looking back, this was insanely progressive for a tiny private Catholic school that didn’t like to make any waves among the parents). Now that I think about it, it’s been awhile since I reread it, maybe it’s time to go back and see if I learn anything new. I LOVED Bridge to Terebithia. But I think the book that made me want to read (and write for the matter) was The Lion the Witch and the Wardrobe by C.S. Lewis. Oh, dear, I really can’t remember what book made me a reader, seeing as I started reading when I was very young (when I was only two, or so family folklore has it). But one book which I’ve read many times, and which still evokes my childhood every time I think about it, is The Lion, The Witch and The Wardrobe. Bridge to Terabithia made me cry! I was never too young to appreciate a good tear jerker. Mine was Wait Till Helen Comes, I remember reading that over and over! Thinking about it makes me want to go pick up a copy and pretend I’m 11 again. Bridge to Terabithia made me cry so hard! I was never too young to appreciate a good tear jerker. I have to say mine was Wait Till Helen Comes. I remember reading that over and over. Mine was probably Anne of Green Gables. I read that entire series to pieces in elementary school. What a fantastic post! I’m feeling all kinds of nostalgic right about now. We went to the library constantly as children, and my mom always read aloud to us as well. I remember her reading The Lion The Witch and the Wardrobe and being completely riveted. But I also appreciate that she encouraged us to read classics. Right about the time that I got into my Boxcar Children phase, my mom started insisting that we put more quality/lasting books into our reading lists. I’m not sure what book made me a reader, though. My favorite picture book was There’s a Hippopotamus on our Roof Eating Cake, which actually includes some controversial material. HA! I also love The Phantom Tollbooth. Anyway, I love to find other life long readers. I’d have to say all of the ‘Junie B. Jones’ books made me a reader, as well as ‘Ramona Quimby, Age 8’, by Beverly Cleary. Although I was not the biggest fan of ‘Bridge to Terabithia’ (maybe it was too emotional for me to handle at that age and I disregarded it as an overrated classic), ‘Dear Mr. Henshaw’, I agree, is definitely another one I enjoyed reading early on. Oh, I still need to read Bridge to Terabithia. I saw the movie…which sounds horrible as a blogger. They sound like delightful books! Hm, the books that started my reading? Possibly the Mandy series. Such a great MG series. Great post! I’ve only read Bridge to Terabithia from this list, though I’m definitely curious about Wendy and Tonya’s choices now. I can’t remember the book that started it all for me! I don’t think there is a single one that I can name, though I did really love Roald Dahl’s books. Also maybe The Lion, the Witch, and the Wardrobe. That was the first book to truly transport me to another world, and I suppose it started my early obsession with fantasy. Harry Potter then, of course, set me on my path to YA. Wow, I am having a hard time trying to decide on what book I can relate that aha moment to. I remember reading anything I could get my hands on, and hoarding my Babysitter’s Club books to make them last. Reading has always been such a part of me that often times I get something that happened in a book confused with reality! We live vicariously through the characters that we read in books and sometimes we get so caught up in them. I think this best describes me the most since I spend so much time reading that I do forget to focus on other things in my life. I love these picks though I’ve only read one of them — Dear Mr. Henshaw. For me, the books that made me a reader were the Baby Sitter’s Club. BSC FOREVER. It’s funny that I hate series books now because I loved them when I was kid. The Babysitters Club is, I think, the iconic series for our generation. I don’t know a single person who didn’t read them as a kid. I would love to get the whole set and reread them as an adult. Wow – I have too many to mention. I read and re-read the Little house series. I was also obsessed with All of A Kind Family. My favorite part was when Henny borrows Ella’s beautiful new dress and stains it and has to figure out what to do. Then there’s A Little Princess, which I cried over. I’ve saved most of my favorites but I read them so much they are falling apart. I am THRILLED that we know someone who knows All of a Kind Family! So few people seem to. I loved that chapter where Henny borrows Ella’s dress without permission–all the Henny anecdotes were fun, really. I always liked Charlotte and Gertie’s stories in bed after dark, and the way they sneakily ate crackers and candy in bed. Haha, I used to absolutely love the Baby-Sitters Club Little Sister books about the little sister, Karen. I had a ton of those books. I wish they weren’t out of print. I haven’t read any of these, but I’ve had Bridge to Terabithia on my list for years. I can’t believe I didn’t read it as a kid. The first books I remember reading were the Berenstain Bears books. Every time my dad and I went to the drug store/post office, I was allowed to pick one and I loved them. The first chapter books I read were RL Stine’s Fear Street books, The Baby-Sitter’s Club, and Sweet Valley High. Anne of Green Gables by Lucy Maud Montgomery is the first book I remember considering my favourite. Oh what a great discussion! Bridge to Terabithia, whenever I read it, made me cry SO SO hard! I don’t remember how I old I was, but it definitely made me feel and it lingered in my head forever. I have quite a few books that have stuck with me for some reason or another. There’s a book that I think is called Baby Island. I don’t remember the details so much but I remember them being stranded on this island and having to make things from what was there and find food and stuff. I read that book over and over again. I also loved Anne of Green Gables. I think that was the first time I found myself swooning over a character (not sure which book in the series cause I haven’t reread). And most all of Judy Blumes books are stuck in my head. The Fudge books cause they were funny and as a family we loved laughing, but some of her more serious ones because they were so honest, which you just didn’t find in childrens/YA books back then. And then Hank the Cowdog was a series we listened to as a family on vacations and it totally kept us laughing our heads off the whole time. There are many many more that could go on this list, but that’s just a few off the top of my head. Was Baby Island perhaps Island of the Blue Dolphins? I was obsessed with that as a kid. Such an interesting and intense story. And I agree, I think Gilbert Blythe was my Original Literary Swoon. How can you not fall in love with him, whatever age you may be? After a certain point in my life, I always enjoyed reading. It was my escape, my vacation from what was – I can admit now – a rather difficult childhood. I was forever at the school library. I distinctly remember the day when I got a public library card for the first time. But The Book that made me? The One that was the catalyst to turning me into the obsessive, compulsive reader I am now? A Wrinkle in Time by Madeleine L’Engle, when I was about 10. I have read it a handful of times as an adult, and yes, there are a lot of adverbs, and yes, it’s got quite a bit of very thinly veiled religious rhetoric behind it, and yes, the pacing has a few odd moments. But it’s the first book I ever remember finishing, and then immediately reading again. It was the beginning of my love of Sci Fi and Fantasy, and it’s just such a great idea – “What is a tesseract?” and IT and Charles Wallace. And MEG. Meg, an imperfect but undeniably strong female protatonist. I have the first few pages memorized. I love this post! It’s great to remember those first novels that really made us readers. I always wonder if I would have been something other than a hopeless fantasy addict if my (solo) reading life hadn’t started out with Lord of the Rings (my parents read the Hobbit to me), then Narnia, then His Dark Materials. …and let’s not even mention Tamora Pierce’s Tortall books, which I discovered shortly after. I was a hopeless case after I read those! Oh my stars…every time we do one of these I get all upset that you haven’t read a book yet, K. Listen to the walrus! His Dark Materials is AMAZING. You will love the book. You will love Lyra. It is not at all childish–it is fierce and terrible and poignant. From what I can remember the writing style didn’t seem expressly for-children, it was more for-anyone-and-the-main-characters-are-preteens, though I was a child so I can’t be sure. I should really read it again but I’m kind of scared it’ll rip me to shreds. Books you read as a child can become so powerful. The Junie B. Jones books are what made me a reader. I read about two Junie B. Jones books a week when I was young. I haven’t read the All of a Kind family yet. I should solve the problem now! I haven’t read these books on your list! But some of my most cherished childhood books (that I still read and read to my children) are the Little House books by Laura Ingalls Wilder. I can’t even tell you all how many times I’ve read them. From there, I think my favorites were the Anne of Green Gables books and the Babysitter’s Club books! I can’t pinpoint how many times I’ve read the Little House books too, Asheley! Love love love them so much, and so many things remind me of Laura. :) I am a big fan of Anne’s, although I’ve always loved Emily of New Moon as well. I think the book that really did it for me was The Girl Who Owned a City by O.T. Nelson. We read it as a class at school and though I had enjoyed reading beforehand (I devoured the Magic Tree House series and, embarrassingly enough, the Mary Kate and Ashley mystery books), this was the one that struck something in me. I immediately went out and bought my own copy and it has remained in my room ever since. I have returned to it and re-read it time and time again over the years, and continue to absolutely love it. Wow, Jessica. That actually sounds quite intense. Never heard of it but will check it out now, so thank you so much for sharing. And I think making an impact, however brief, as long as it lasts, is a book’s greatest achievement. That book seems to be so polarizing, Jessica–but it sounds so intriguing! I have had it on my list for awhile, it definitely sounds right up my alley. I think reading the Nancy Drew & Trixie Belden mysteries made me a reader. I also read alot of SVH because I enjoyed those twins and all the trouble that they got into. I don’t really remember Mixed Up Files–I need to pick that up again sometime. I can’t remember what book got me reading…I don’t remember ever not reading. But I’m going to go with Charlie and the Chocolate Factory on this one because it’s the first book I remember reading and then thinking I NEED TO READ EVERYTHING THIS AUTHOR HAS EVER WRITTEN I NEED ALL THE MOVIES AND I NEED MOOOOOOAAAAAAAAAARRRRRRRR. So. Yeah. Roald Dahl is a genius. He is! The Witches is my favorite, but I’ve really enjoyed almost everything I’ve read of his. I love his adult short fiction as well, especially the mysteries. THREE INVESTIGATORS! Among my preteen favorites. :) I have almost all of them, they were so clever–and I always wanted a hidden hideaway and chalk to leave marks behind. Such unusual mysteries, and all fairly sophisticated, too. I never read those books. I didn’t read much when I was younger. But I remember when I was about 10 or 11 I read The Man who Loved Clowns by June Rae Wood and that’s when I realized I liked to read. Wendy, I don’t know your book (but it sounds adorable!) but I LOVE and totally remember both K & Tonya’s books! One of my favorites growing up was the original One Hundred and One Dalmatians. Such a great story. Oh please please give AOAKF a try–they are so scarcely known for some reason, and they’re just lovely. I liked 101 Dalmatians when I read it as a child, though I don’t remember much about it. I remember reading James and the Giant Peach in school. After that The Babysitters Club and Sweet Valley High were my books of choice. The Witches was my favorite Dahl. :) All his books were so funny and dear, especially with the Quentin Blake illustrations. I went through a SVH phase, too–such guilty pleasures! I still have a few of my favorites, including the oh-so-dramatic Regina Morrow one. These are not the most literary of books to pick, but I feel like the books that really got me reading were the Sweet Valley Twins series (the ones where the girls are in middle school). I used to read 4 a week as a kid and I just loved them. I loved those as well. I kept reading through SVH and SVU! Madeleine L’Engle’s A Wrinkle In Time series was one of the first book series that I read and turned me into an avid science fiction reader. To this day, they are still among my most beloved books. I really liked A Wrinkle in Time when I read it as a teenager, but I didn’t read beyond the second book. I’ve been meaning to revisit at some point to see how it holds up as an adult–I even bought the anniversary edition last year, although I already had a copy at home! I know, so nerdy. I distinctly remember reading & becoming obsessed w/ The Gingerbread Man and Cloudy with a Chance of Meatballs in preschool :) Good times! I remember going to the school library and reading The Samurai’s Tale by Erik Huggard (http://www.amazon.com/gp/product/0618615121). I’ve read other books before, but this book got me thinking past Disney princesses and always having a HEA. I LOVED The Samurai’s Tale! I actually just found a copy at a used bookstore and got it for B. Can’t wait to reread with him. My mom took me to the library once a week as well, but only after I’d managed to read all the books she bought for us to read together at bedtime (I couldn’t wait to finish them!). As a child I read historical fiction/literary classics exclusively, and even though I sometimes have trouble with those books as an adult, I still have a soft spot for them. Some of my favorites are Johnny Tremain, Anne of Green Gables, the American Girl books, and the Little House books. I loved Christopher Pike! I think that was my first foray into the Paranormal. I can’t remember not being a reader that being said the first series that sticks with me is Little House on the Prairie. And growing up in Wisconsin this series was a very big deal. I still read them for memories of home. I am a huge, huge Little House fan. HUGE. I’m so jealous that you lived near one of the homesteads! I’m headed to Almanzo Wilder’s family farm in upstate New York this summer, and I am super excited. Lovely post! I have always been a reader, but the first book that really enchanted me was “The Secret Garden.” My bedroom closet was built over a staircase, so the shelves were stepped. The top one was tall and very deep, and I made a little hidden nest up there with a blanket and flashlight where I’d go to read. That, legitimately, sounds magical, Jenny. I would’ve loved that when I was younger. To have your own little reading sanctuary, sweetness! That sounds lovely, Jenny–just lovely! I would love having that now, too. How wonderful. I must echo my co-bloggers and say how wonderful that sounds. I’d love a little reading nest for myself now. It was THIRTEEN by Candice Ransom, and came along at a time when I desperately needed it. That book is partly why I write coming of age MG right now. Bridge to Terabithia was probably the first book that made me ugly cry. I remember walking around in a haze of pain for DAYS after I finished it. Obviously, that has happened many times since then with many other books. Ha! Little Women was a big one for me because I read it so many times. I also loved a book called The Silver Curlew, which no one has ever heard of. I think it’s out of print but I loved that book. 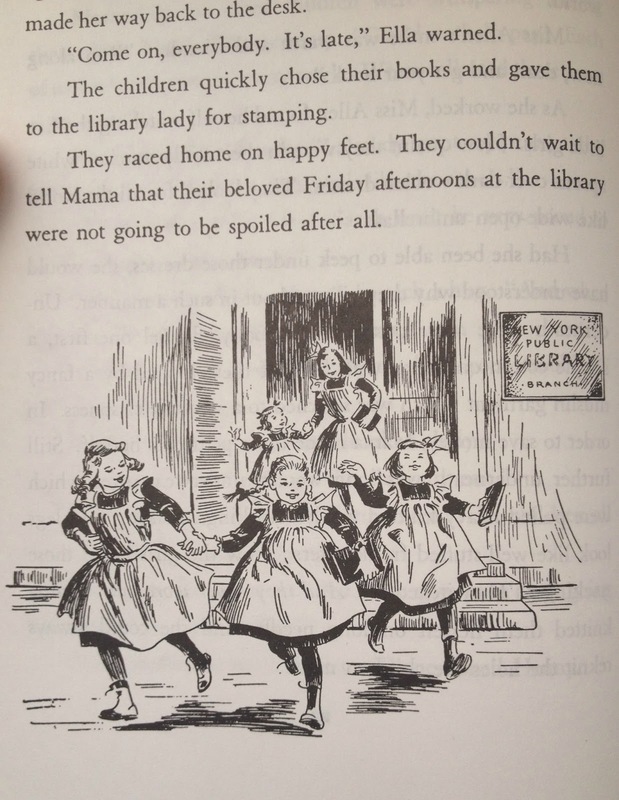 I am appalled that you haven’t read Little Women, K. APPALLED. It was THIRTEEN by Candice Ransom. It came at a time when I desperately needed it and it’s why I write coming of age MG now. What a great question! I remember reading a couple of Candace F. Ransom Sunfire books in my teens–is that the author you’re referring to? I haven’t read THIRTEEN, though! For me, it wasn’t one book. All of my childhood was so bound up with reading. My childhood favorites were mostly horse and dog books, like Marguerite Henry, Walter Farley, Jack London, Jim Kjelgaard. Stuff like that. I read a ton of horse books too, including Marguerite Henry and Walter Farley–I’m curious if they’d still hold up as an adult. I think every girl goes through a horse phase at some point in her life! It was really allllll the books that formed my love of reading, too. But I had to choose just one, so I went with this, hah. It definitely did make me look at books in a different way, though. It’s interesting to reflect upon the stories that stuck with us as children and understand just what it was that made them so impactful. Children are so much more perceptive than people give them credit for and I’ve found the value in their stories to be much more profound than a lot of “adultly” books I read now. I think it’s safe to say, I read more for entertainment than for a moral purpose, but that wasn’t so much the case when I was a kid. The first book, or collection rather, that I remember vividly was Beatrix Potter’s Complete Tales that my nan brought over with her from England. I still have it and it’s very well worn. I love how every story resonated with me and taught me a valuable lesson. This is one of those books that I’ll pass down to my children if/when I have them. Wonderful discussion ladies! I would cherish a copy of that if I’d had one. I remember watching the show when I was little and loving it. I read VORACIOUSLY as a child as did my siblings. My parents had mandatory no book time in our house so that we would do something other than read. We’d carry books to the car just to drive to the grocery story. That being said, there are a couple of books that really stand out in my mind when I think about books that kept me reading: Bridge to Terabithia. I adore The Secret Garden–I try to reread it every couple of years. :) I need to check out Juniper if you’re recommending it! One summer, I went to my aunt’s cottage. As my family and I were getting ready to leave, she gave me a box filled with Readers Digest books and A Walk to Remember was in it. The movie had just come out so I read it. I started in the car at my aunt’s cottage. I finished that same night I got home to my bed. Memories! I read The Bridge to Terabithia to my little girls the summer before last. It was wonderful and really stuck with my oldest. I definitely agree that one is for “older” kids…only because its so much more powerful when they have a grasp of the many issues dealt with in the book. I love the story about your mom taking you to the library, Wendy :) All of a Kind Family sounds like my kind of read. 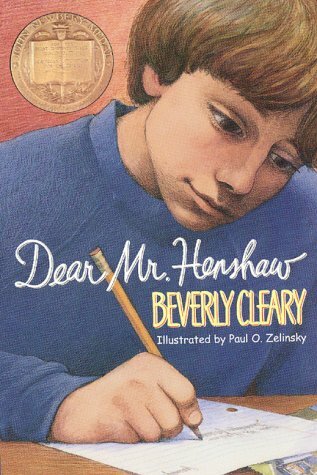 Beverly Cleary is one I’m very familiar with, though I never read Dear Mr. Henshaw. It’s great that you came across that book right when you needed it, Tonya. It’s nice when you find books that speak to you like that. It’s one of my favorite MG series, Lucy–and sadly, so few people seem to have heard of them. I hope you get a chance to try it soon! I adore Beverly Cleary as well–she was definitely a formative author for me as a child, too. Funnily enough, Dear Mr. Henshaw was one of my least favorite books of hers, hah, but I wonder how I’d feel reading it a an adult. Well, my first novel I ever read was Winnie The Pooh, infact I still have it. After that I just got into everything that got put in my hands. And even years from now, I sitll have the same reading preference. I read Goosebumps, Sweet Valley high, babysitter club, and the metamprohisis series. Still today, I love paranormal and comtemporary. I read Goosebumps, too. I just liked the show better ;) And oh, the metamorphosis! !